We all heard that “demography is destiny”. But how many of us truly believe it? If demography was destiny, the world would look very different today. The two demographic giants China and India would be uncontested economic and military powers. The United States would be a regional power struggling to keep up. Larger European nations such as Britain, France and Germany would barely register on the economic map, while smaller ones such as Switzerland and Finland would be invisible. Nigeria and DR Congo would be African powerhouses. Brazil, Indonesia and the Philippines would be the shining stars of their continents. None of this is true because demography is not destiny. Population size alone does not set a country on a predictable course. Still, demography is, among other factors, an important determinant of destiny. While the rate of demographic growth (or decline) is important, what is more important is the age distribution of the population. Too many old people means an elevated dependency ratio and less income available for spending and investing. Too many young people means an overburdened education system and high unemployment. The chart below shows for each country the percentage of the population that is aged 0-29 vs. per capita GDP based on purchasing power parity (PPP). The correlation is undeniable. Countries with a smaller percentage of young people have higher GDP per capita. Many of these countries and regions, including the United States, Europe and China, have benefited from a demographic dividend while their birth rates declined in recent decades. Conversely, countries with more young people have lower GDP per capita. Most of them are in Asia and Africa. We can argue about causality. Are countries poorer because they have more children? Or do they have more children because they are poorer? Or are they both poorer and have more children because of a third factor? Nothing is simple and all three are true. Countries are poorer because they have too many children, mothers have no time to educate themselves, and there is little or no disposable income to save or invest. But countries also have more children in part because they are poorer, have inadequate health services and suffer from high child mortality. And many countries are poorer and more fertile because female literacy is low and gender inequality is high. What is known is that countries that experience a decline in their birth rate sometimes realize a demographic dividend, an economic boost that can last years or even decades. Improving health care and boosting literacy have been shown to break the cycle of extreme poverty and extreme fertility. 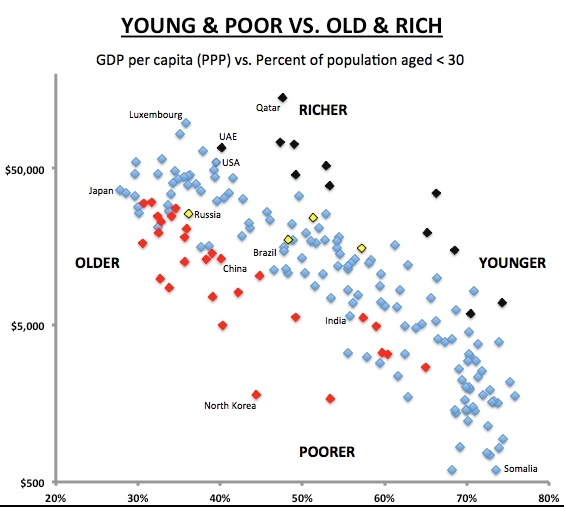 Meanwhile, this is the world that we face in the next few decades: rich countries that are getting older and poor countries that are very young. Working-age populations are shrinking in the rich countries while in poor countries, they are booming beyond those countries’ abilities to educate them, shelter them and employ them. 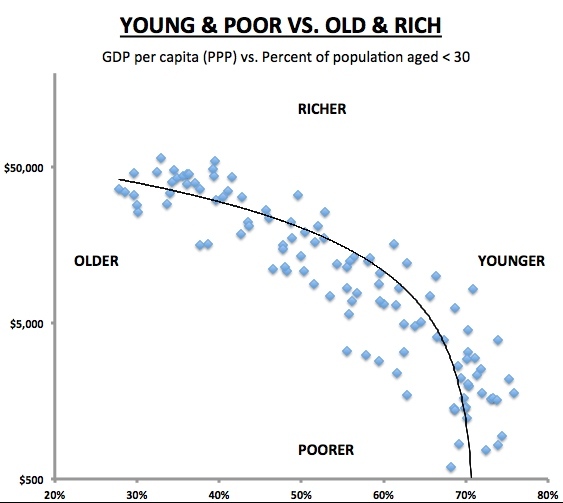 The chart above shows that there are many outliers, countries that are either poor despite being relatively older, or richer despite being relatively younger. When we looked to see if the outliers have anything in common, it turned out that they do. The first group (old and poor) are shown in red and are the countries that are former or current communist states. The second group (rich and young) are shown in black and are the leading oil and gas-producing nations. The yellow data points are the nations that are (or were) both communist and wealthy from energy resources. Communism may be considered an “unusual” way of managing an economy since it conflicts with strong human instincts for creativity and innovation. Likewise, the huge accidental wealth that comes from finding oneself living on top of vast underground resources may also be deemed “unusual” (or certainly lucky) since it is probably rare, or perhaps even unprecedented, in several millennia of human experience. If we remove the outlying red and black data points, we end up with the chart below with a much better regression and trend line and an r-squared of 0.78, a large improvement from 0.37 when all the data is included. The trend line is curved because the y-axis is on a log scale. This reinforces the idea that in a large majority of countries, young populations tend to be far poorer. At first, this statement may ring intuitively true and uncontroversial, because young people have had less time to accumulate wealth, until one examines the magnitude of the wealth gap. The GDP per capita of the very youngest nations is less than 5% that of the oldest. The Central African Republic’s is 1% of Switzerland’s. This is a constantly changing dynamic. And it remains to be seen whether the rich countries of the West can weather the aging of their populations and maintain their GDP per capita at current levels. They may struggle to do so and we may find that over the long term, demography reasserts itself every so often, even if temporarily, as the leading driver of our destiny. You can have robots do most of the work. The problem with age is physical or mental health. If drugs in the future make a 75 year old the same as a 65 year old, then this is not a problem. Many of the part time jobs in the economy could be done by the elderly if they have better health. So, the elderly working part time reduces their need for social security and medicare as much. They are drugs or treatments now that could slowdown the aging process but it depends upon how available they are. Cynthia, it is true that extending the retirement age to 70 or later could go a long way to solving the problem. Have to run the numbers to see how they look in the US, Europe or Japan.